You’ve found no sound on your Dell laptop when you’re about to listen to music or watch a video? This is so frustrating. But don’t worry. We’ll help you fix the sound issue on your laptop. Here are the solutions that have helped people resolve no sound on laptop. You shouldn’t have to try them all; just work your way down until the laptop sound works. Note: the screenshot below come from Windows 10, and the fixes apply to Windows 8 and Windows 7. Ensure your speaker volume is not muted. Sometimes the volume is muted and you’ll absolutely hear no sound. 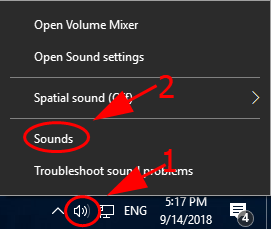 Just check the Volume icon on your desktop, and drag the slider to maximum and see if you can hear any sound. In addition, simple take a look at the speaker on your laptop, and see whether there is anything covering upon the speaker. You should also check the headphone jack if you’ve plugged into a headphone with your laptop. Look inside the jack and see if there is any damage or dust or lint that may stop your headphone from working properly. If so, clean the jacks with a cotton swab or brush. 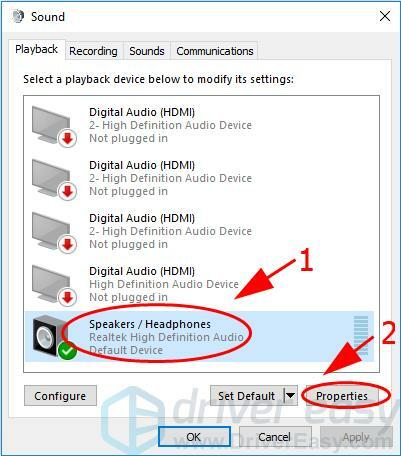 If you’re connecting a mic or headphone with your laptop, you should also make sure the device is working properly. Try disconnecting and reconnecting and see if there is any sound. Or you can try another mic or headphone and see if where the problem lies in. 1) On your desktop, right click the Volume icon at the bottom right corner, and click Playback devices. If you don’t see Playbackdevices in the list, you can click Sounds and click Playback tab in the popup pane. 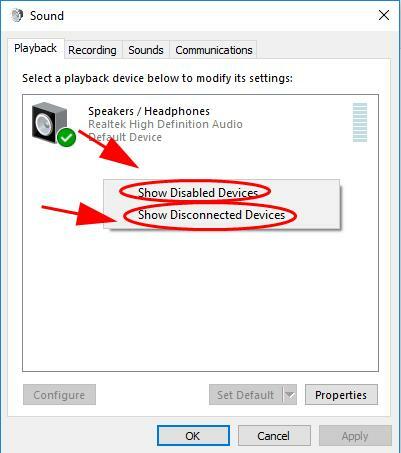 2) Under the Playback tab, right click on any empty area in the device box, and check Show Disabled Devices and Show Disconnected Devices. 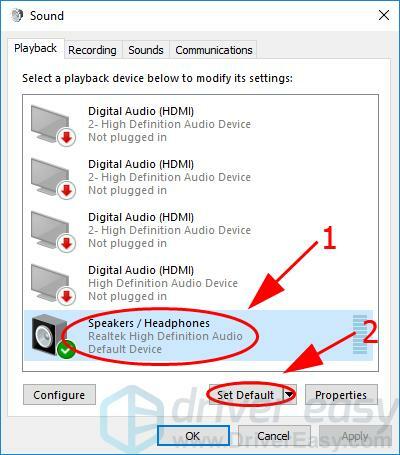 3) Right click on your speaker device, and select Enable. 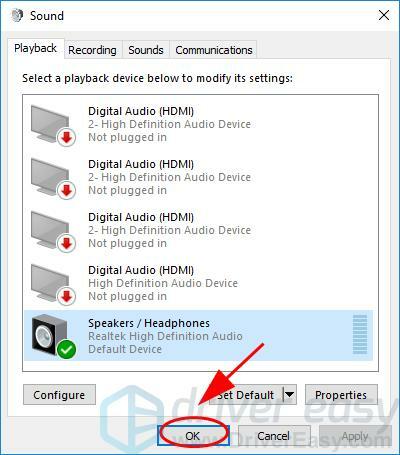 4) Then select your speaker device, and click Set Default to set your device as the default audio device. 5) Click OK to save your changes. 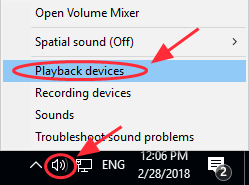 Try to play any sound to see if there is sound coming from your laptop. If you don’t see Playback devices in the list, you can click Sounds and click Playback tab in the popup pane. 2) Under the Playback tab, select your audio device, and click Properties. 3) Click the Advanced tab. In the Default Format section, select different audio format, then click the Test button. See if you hear any sound. You’ll need to try different audio formats to find the one that works. 4) Once you find the format that works, click Apply and OK to save the settings. If the no sound issue still happens, don’t worry. We have something else to try. 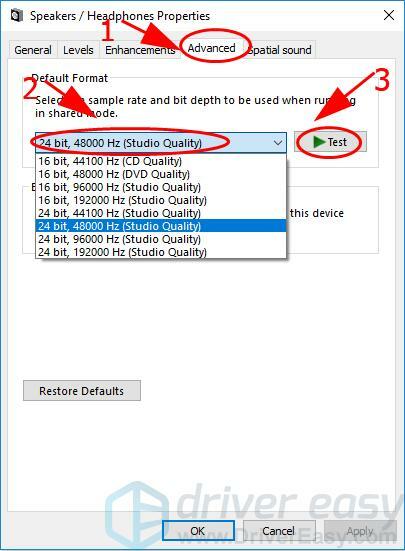 A missing or outdated audio driver can also cause no sound on computer. 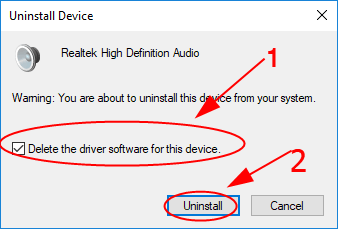 If uninstalling the driver doesn’t solve your problem, you can try to update the audio driver to have it work. 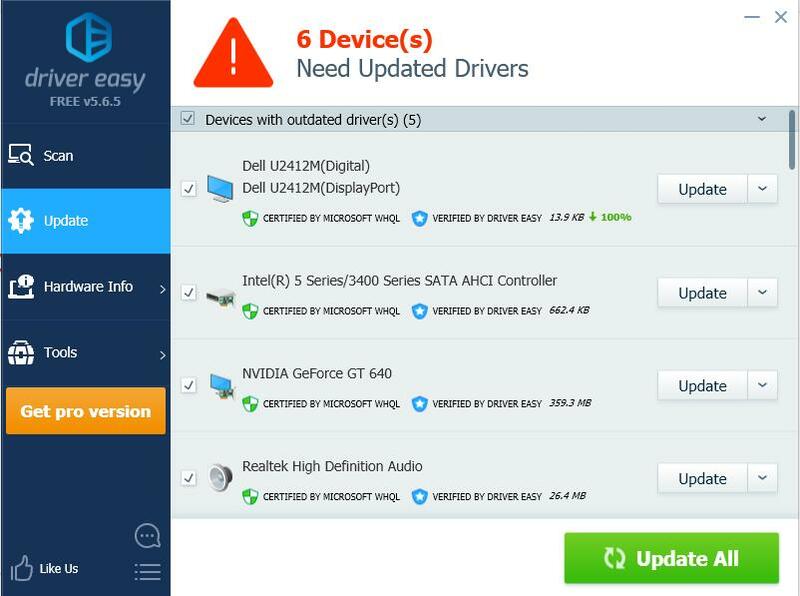 There are two ways to update drivers: manually and automatically. 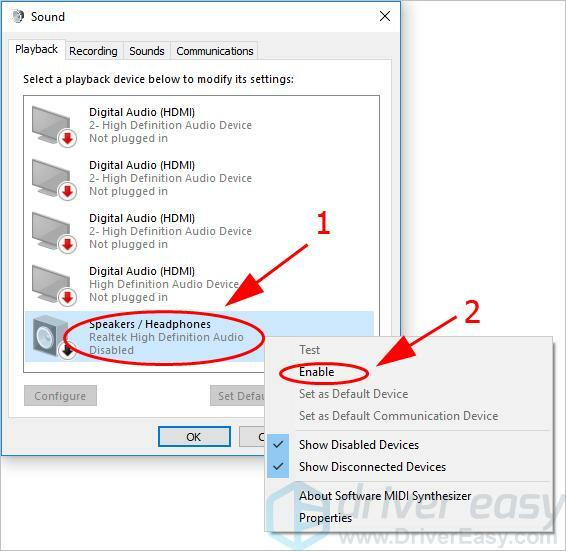 Manually update driver – You can manually update the audio driver by searching on the manufacturer’s website, find the latest and correct driver that is matched with your Windows OS, and install it in your computer. This requires time and computer skills. 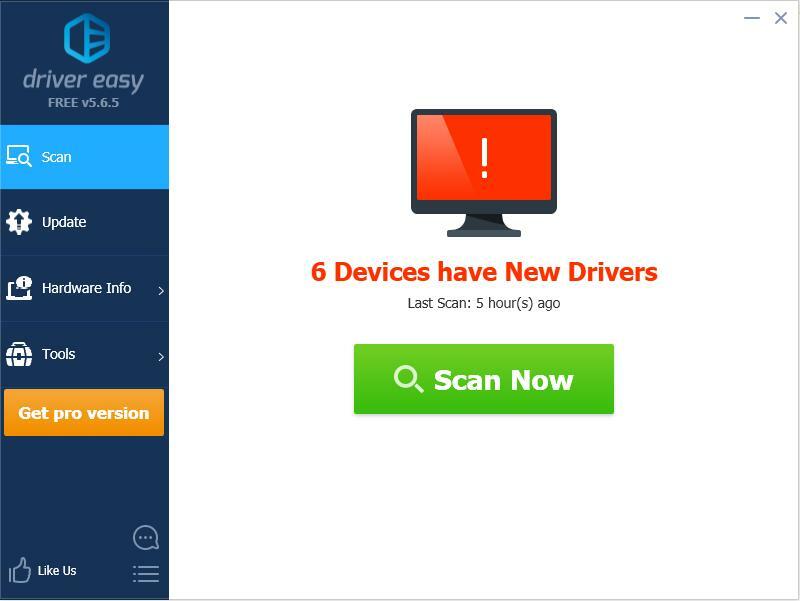 Automatically update driver – If you don’t have time or patience to manually update drivers, you can automatically update drivers with Driver Easy. 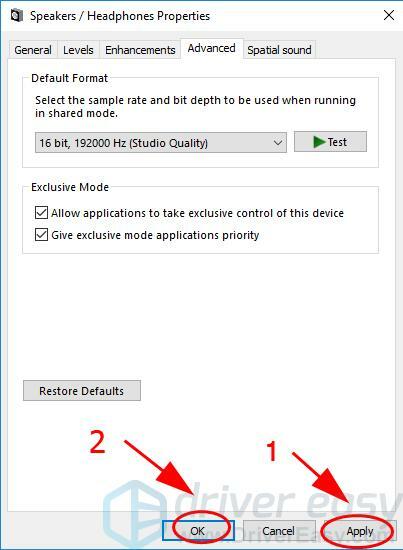 3) Click the Update button next to the flagged audio device to automatically download the correct version of their driver (you can do this with the FREEversion), then install it in your computer. 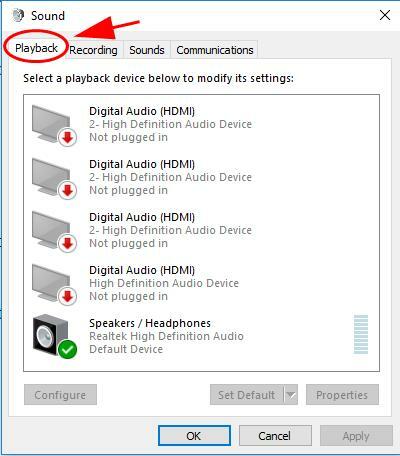 If your audio driver is corrupted with your system, you’re likely to have the no sound on your Dell laptop. 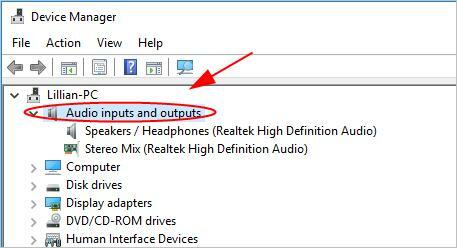 You can uninstall and reinstall the audio driver and your input/output device driver to fix it. 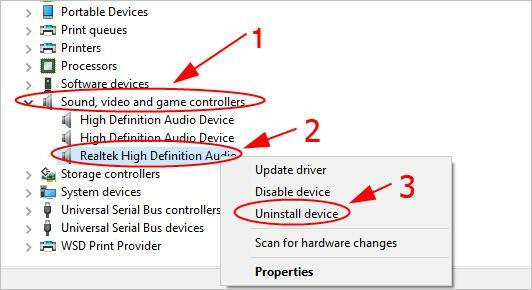 3) In Device Manager, double click Sound, video and game controllers to expand it, right click on your audio device and select Uninstall device. 4) If you see a popup to confirm, check the box next to Delete the driver software for this device, and click Uninstall. 5) After uninstalling, double click Audio inputs and outputs to expand the category. 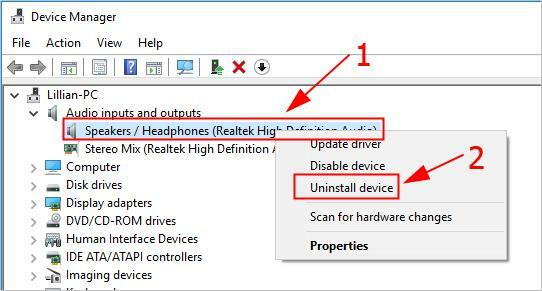 6) Right click on your speaker, and click Uninstall device. 7) Follow the on-screen instructions to uninstall it. 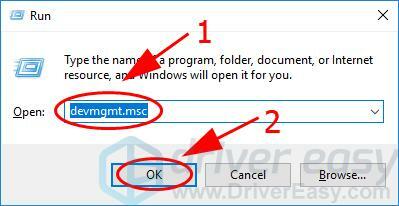 8) After uninstalling, restart your laptop and Windows will automatically reinstall the device for you. Then try again to see if the sound works now. That’s it. Hope these solutions comes in handy and fixes the no sound issue for your Dell laptop. If you have any questions, feel free to leave a comment below and we’ll see what more we can do to help.